The Silver Class children have been taking part in many varied activities throughout the curriculum as they come towards the close of their first term at Turney School. Our literacy work has been based around the book Old MacDonald. The children have been exploring some of the sounds that can be found within the book. We have been identifying the many different farmyard animal noises, and then offering our own take on what they might sound like. Maths work in Silver Class has been mainly shaped based. The children have been introduced to the idea of identifying different shapes. We have been playing plenty of drama games by using our own bodies to create a specific shape. The outdoor play area in Silver Class has been put to plenty of use during the recent fine weather. This is a great resource for the children to develop their motor skills. 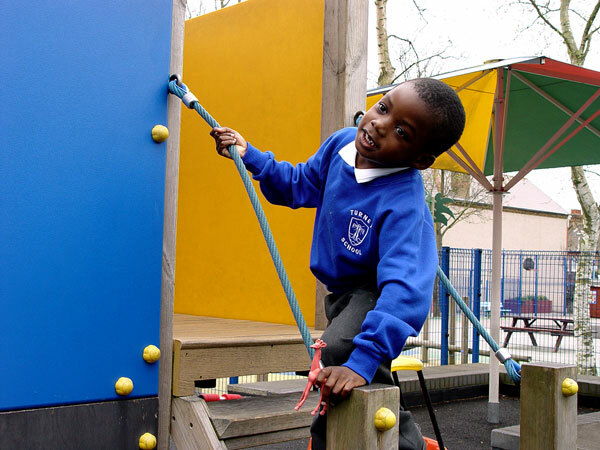 We encourage the Silver Class children to explore the facilities and to develop their own confidence when climbing, crawling or jumping. Water and sand are also outdoor resources that the Silver Class children have enjoyed playing with. A large part of this first term for the Silver Class pupils has been all about learning how to play and learn together. We have used music to help us with this exercise. The children have been sharing the different musical interests that we have in Silver Class and helping out our class friends with their learning.